As the weather gets hot, the humidity seems to increase. Humidity is the moisture that gives the air a heavy, damp feeling that makes a hot day seem even hotter. Outdoor humidity is perfectly normal, but when you are experiencing a high level of indoor humidity, it can cause moisture-related problems. Mold and mildew growth in walls and carpets that lead to odors, allergies, and even structural damage are the direct result of excess indoor humidity. There are variety of ways to keep indoor moisture in check, including HVAC maintenance tips. 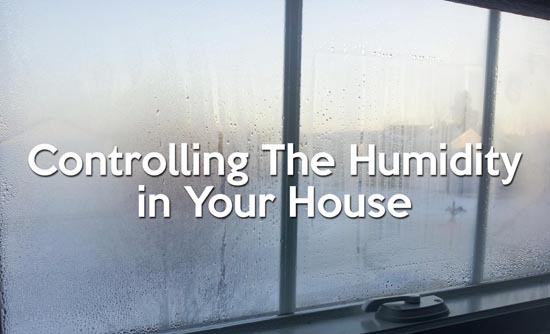 Try any or all of these ways to reduce your home humidity. Use vent fans in kitchens and bathrooms. Most kitchens are equipped with vent fans above the stove top, which can greatly reduce cooking-related humidity. Run your bathroom fan when you take a shower or bath to vent excess humidity that comes from using hot water. Use a dehumidifier. Dehumidifiers are machines that collect moisture from the air and turn it into water that can be drained or dumped out. Using dehumidifiers in damp areas like basements can prevent damage from too much indoor humidity. Keep your air conditioner well maintained. Central air conditioning systems as well as window units and portables automatically control humidity when they are working properly. If you start to notice excess humidity all of a sudden (think fogged up windows and moisture collecting on metal surfaces), it likely means your air conditioner is not working properly. It could be a blocked drain pipe or some other issue with your system. Follow basic HVAC maintenance tips and get a tune up to keep your HVAC system running smoothly and properly controlling indoor humidity levels. If you notice humidity after installing a brand new system, it may mean your new air conditioner is not the right size for your home. Make sure your clothes dryer is properly ventilated. Clothes dryers typically vent to the outdoors. If this is not the case or if your ventilation tube is blocked, the excess indoor humidity could be coming from your laundry room. Check your dryer to make sure it is in good working order and venting as it should. Seal your basement and/or have a sump pump or French drain installed. If a damp basement is the root of your humidity issues, consider having it professionally sealed to keep out excess moisture from the ground that can seep through concrete walls. French drains and sump pumps remove moisture from your basement by pumping the water up and out. Besides the obvious benefits of preventing mold and mildew, keeping humidity levels low in your home will make it feel cooler and more comfortable during the hot weather season. You can even raise the temperature in your home and still feel cool enough when the air is drier, which helps you save energy and keep your power bill lower. Follow the above suggestions and HVAC maintenance tips to keep your home dry and comfortable this summer. And call (336) 226-9371 to schedule AC maintenance with Alamance Oil, Carolina Fuels or Berico.